Explain the significance and use of a LIFO reserve. Understand the effect of LIFO liquidations. Explain the dollar-value LIFO method. Identify the major advantages and disadvantages of LIFO. 10. 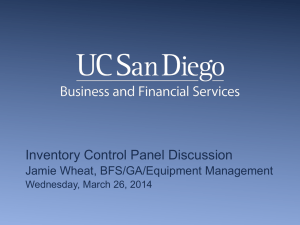 Understand why companies select given inventory methods. goods to be used in the production of goods to be sold. 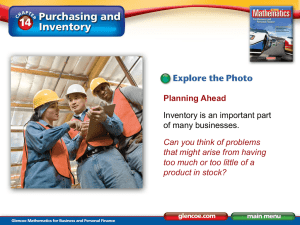 LO 1 Identify major classifications of inventory. LO 2 Distinguish between perpetual and periodic inventory systems. Purchases of merchandise are debited to Inventory. purchase discounts are recorded in Inventory. 4. Physical count done to verify Inventory balance. 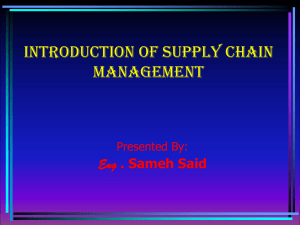 record of Inventory and Cost of Goods Sold. Purchases of merchandise are debited to Purchases. 2. Ending Inventory determined by physical count. consigned goods, special sales agreements). The costs to include (product vs. period costs). obtains legal title to the goods. will be misstated for both years. 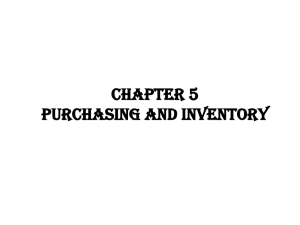 LO 3 Identify the effects of inventory errors on the financial statements. income because the errors offset one another. 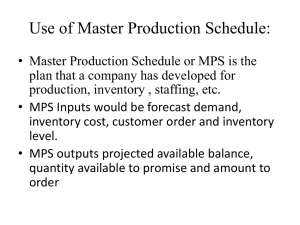 LO 4 Understand the items to include as inventory cost. What Cost Flow Assumption to Adopt? that most clearly reflects periodic income. used to account for inventories. 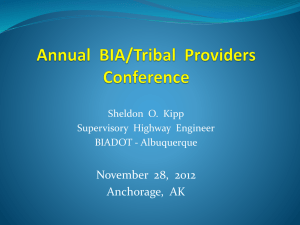 Cost, and Specific Identification cost flow assumptions? Inventory information for Part 686 for the month of June. 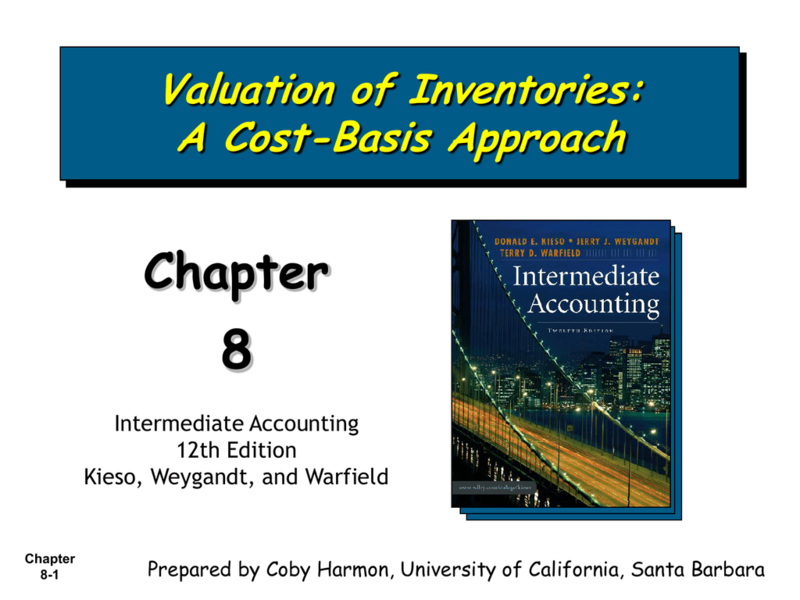 Sold and Ending Inventory under FIFO, LIFO, and Average cost. 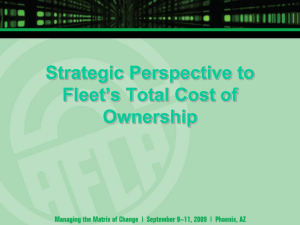 LO 6 Explain the significance and use of a LIFO reserve. of goods sold, higher net income, and higher taxes. LO 7 Understand the effect of LIFO liquidations. dollar value, not physical quantity. Broader range of goods in pool. Permits replacement of goods that are similar. Helps protect LIFO layers from erosion. LO 8 Explain the dollar-value LIFO method. inventory for 2003 through 2005.
is expensive and time consuming. reduces record keeping and clerical costs. more difficult to erode the layers. Dollar-value LIFO is used by most companies. 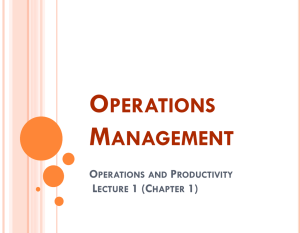 LO 9 Identify the major advantages and disadvantages of LIFO. 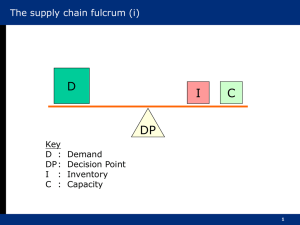 LO 10 Understand why companies select given inventory methods. 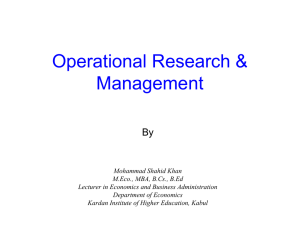 Copyright © 2006 John Wiley & Sons, Inc. All rights reserved.